Gadreel heals Castiel of his stab wounds. Castiel heals Sam after Gadreel is expelled. Healing is an ability used by angels to repair the physical damage of others, usually humans, and in some cases other angels. An angel's ability to heal or resurrect the dead is typically tied to Heaven; if an angel is cut off from Heaven in some fashion, they may lose the ability. Angels, unlike demons, will also heal a vessel of any and all injuries they receive while possessed. When an angel heals a human, or another angel, the effect can be achieved by either placing two fingers on the injured's forehead or through a bright light emanating from the palm of the angel's hand. 1.24 9.23 Do You Believe in Miracles? The Reaper heals a man for Roy Le Grange. Sue-Ann Le Grange uses black magic to harness the power of a reaper to make her husband Roy Le Grange seem like a real faith healer. When Dean is diagnosed with a damaged heart after a rawhead hunt goes sideways, Sam takes him to see Roy, who heals him of his ailment. When the Winchesters learn that Sue has been sending a reaper to kill those she deems unworthy and transfer their life force to others, they end her control over the Reaper, who quickly turns on Sue. To save Dean's life, John summons and make a deal with Azazel. In exchange for Dean being healed, John gives up the Colt as well as his life. When the deal is struck, Azazel travels to the Veil where he possesses the reaper Tessa and pulls Dean back to his body, healed of all wounds. As a side effect of Dean being resurrected by Castiel, all of his past wounds have been healed. As he relates to Sam in 4.05 Monster Movie, he has no more bullet wounds, knife cuts, or fingers left off-angled from old breaks. He mentions that his skin is as smooth as a newborn's, as well as theorizing that with his new body, he is once again a virgin. After Alastair breaks free from the devil's trap and severely injures Dean, Sam demands that Castiel heal his brother, but is initially refused. After learning of Uriel's betrayal and killing him with the aid of Anna, Castiel returns to the hospital and heals Dean. When Jimmy Novak is mortally wounded, he pleads with Castiel to leave his daughter and let him be his vessel again. After Castiel warns him of the toll it will take, Jimmy accepts and is possessed, whereupon his wound is healed. In the face of Dean's continued refusal to become Michael's vessel, Zachariah first offers to heal Bobby of his paralysis. When Dean still refuses, Zachariah gives him stage 4 stomach cancer, and removes Sam's lungs. As the boys writhe in pain and hypoxia, Castiel arrives, claiming to have been resurrected by God, and demands that Zachariah put Sam and Dean back together and leave, which Zachariah reluctantly does. 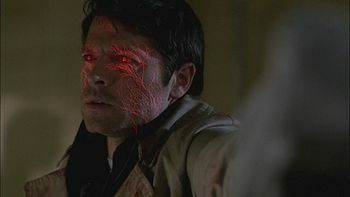 Castiel reveals to Bobby that his powers are derived from Heaven, and with him being cut off, certain abilities are no longer at his disposal, such as healing Bobby's paralysis. After Sam and Dean are shot and killed by Walt and Roy, their journey in Heaven takes them to the "Garden", where they meet an angel named Joshua, who tells them to stop looking for God, as they will not find him. Joshua also tells them of their many prior deaths and how this time he has been given instructions for Sam and Dean to remember, before sending them back to earth in their restored bodies. After Castiel is brought back to life by God, he proceeds to heal Dean of all his wounds incurred by Lucifer and resurrects Bobby. After being bitten on the neck by Eve, Dean, believing he's been turned into a Jefferson Starship, asks Castiel to "clear that up too" when healing his neck wound. When a demon possessing Lisa stabs itself in the stomach, Dean rushes Lisa to a hospital after exorcising it from her body. At the hospital Castiel places his hand on her forehead, healing her in addition to removing any memories of Dean from Lisa and Ben's mind at Dean's request. Believing himself to be the new "God", while walking the streets Castiel heals a homeless man of his blindness. Castiel takes on Sam's Hell trauma. Desperate to save Sam from his hallucinations, Dean receives a call from a fellow hunter named Mackey who tells him of a man named Emmanuel Allen who can heal the sick, telling Dean of his right eye being cured of its blindness. Upon learning Emmanuel is an amnesiac Castiel, Dean takes him to the hospital where Sam is staying, where after confronting demons, Castiel remembers his true identity. Unable to cure Sam of his insanity, as an act of penance for destroying Sam's mental wall, Castiel transfers Sam's trauma from the Cage to himself, becoming catatonic in the process. After an orderly is found with a gunshot to the stomach, Castiel heals him, allowing Dean to question him about the missing Fred Jones. When Castiel's mind is rebooted from coming into contact with the angel tablet, he goes on to heal Dean of the wounds he'd inflicted while nearly beating him to death. Metatron heals Kevin Tran after rescuing him from Crowley. After stealing Castiel's grace, Metataron heals the cut in Castiel's neck used to siphon the grace from his vessel. Due to the nature of Sam's failing health and his own injuries from the Fall, the angel Ezekiel proposes to Dean he possess Sam to heal him from the inside out, as well as allow himself to heal, and when they are both healthy he will vacate Sam's body. Desperate, a reluctant Dean agrees and together they are able to trick Sam into consenting to being a vessel. After being tortured and stabbed by April Kelly, Ezekiel heals Castiel of all his cuts and knife wounds. Gadreel takes over Sam's body and heals his wound. 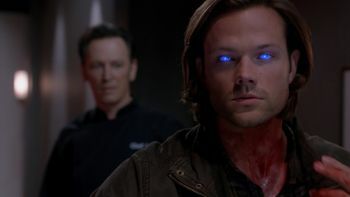 When Sam receives a severe neck wound from Chef Leo, Gadreel briefly takes over and heals the wound, erasing Sam's memory of the attack as well. Castiel heals the puncture marks in Sam's head after their attempt with Crowley to hack Gadreel's brain to expel him from Sam's body. Castiel continues the healing process which was begun by Gadreel to heal the internal burns from Sam's attempt at the demon trials. Learning that the residual grace from Gadreel's possession is fading each time he is healed by Castiel, they attempt to extract what remains to use to track the angel. However, the extraction proves to be too much for Sam, and in an act of compassion, Castiel heals Sam of his wounds completely, removing the remaining grace in the process. Castiel is drawn to a warehouse by the Horn of Gabriel, where he finds angel upon angel slaughtered in a room. He comes across an injured angel named Hannah, and heals her of her wounds. After Gadreel is attacked by Dean with the First Blade, Castiel and Sam find him in a field outside the Bunker. As Castiel goes to heal him, Gadreel initially refuses due to the toll it would take on Castiel's fading grace, but Castiel goes forward and heals him. Seeking Crowley's aid in tracking down Metatron, Dean is shown a camera phone video of Metatron, as a homeless man, healing a woman who had been hit by a car. Later at a homeless encampment, Metatron heals a man named George of his diabetes (filling his flask to celebrate as well). When he is unable to heal his own chest wound, Castiel is aided by Hannah who offers to help him. Dean is sitting at a piano in a bar, playing a few notes but his mind is elsewhere. He takes out the First Blade and slices open his left palm. It instantly heals. Later when confronting Cole Trenton in the bar parking lot, his cheek is cut, but like his hand it heals instantly. When Castiel is severely injured by the angel Adina, Crowley arrives and removes the angel's grace and kills her. He gives her grace to Castiel, which heals him of all his wounds. After breaking Metatron out of Heaven's jail, Castiel pulls out his angel blade, slices Metatron’s throat open, and takes his grace in a little glass vial. Castiel goes on to heal Metaton's throat wound, before Sam shoots him in the leg. Charlie asks if Castiel can heal her carpal tunnel and bullet wound, and Castiel gladly obliges. He does suggest that Charlie continue wearing her wrist brace at night. Due to Tamiel feeding off Amelia Novak's soul, Castiel is unable to heal her of the damage her body has been through. 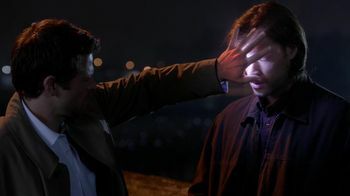 After finding Metatron filming the aftermath of a man getting shot, Castiel heals the victim of his gunshot wound before taking Metatron away for questioning. Castiel reveals to Dean he is suffering from smiting sickness due to proximity to the angel's attack on Amara, and is unable to heal him of it. He tells Dean to get as far away from ground zero as possible. Reeling from the mass smiting by the combined forces of Heaven, Amara is found by Rowena who goes on to use magic to heal Amara's body back to full strength -- an act which Rowena soon regrets after witnessing the Darkness' power. Lucifer is healed by Chuck. After rescuing Lucifer from Amara, a beaten and bloody Lucifer is healed by Chuck, which Lucifer is not happy about and resents. When Dean is able to appeal to Amara's love for her brother, she teleports the mortally-wounded Chuck to the garden where the two reconcile, with Amara placing her hand on his chest and healing him of his wounds. With Chuck no longer dying, the sun begins to shine brightly in the sky. At Needham Asylum, Crowley and Rowena attempt to trap Lucifer to send him back to the Cage. With Lucifer unable to move, Crowley throws top-shelf sulfuric acid onto his vessel, in an attempt to damage it to the point Lucifer can no longer occupy it. 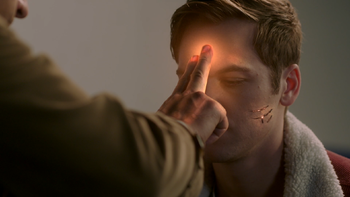 As Vince Vincente's face begins to burn away, Lucifer is able to power up and heal his vessel of its wounds before Rowena can send him back. Dean mentions that Castiel healed Sam's blow torched "s'mores foot" and they should get back to hunting. While tracking Lucifer, Castiel and Crowley are directed towards Vince Vincente's sister, Wendy, whom they learn Lucifer promised to Vince he would heal and give her back the use of her legs. After being banished to the bottom of the ocean in his deteriorating vessel by Rowena, Lucifer is summoned to the basement of a teenager through his fossilized feather. Placing the fossil on his chest, he is engulfed in a bright light and his vessel is healed of all deterioration. In a confrontation with Ishim, Lily Sunder is slashed across her side by Castiel. After escaping, Lily is able to tap into her Enochian magic and heal the wound. At Ishim's safe house, Castiel remains with Ishim to heal his wound, which weakens him, as Sam and Dean search for Lily. As Castiel is slowly and painfully dying from being stabbed with the Lance of Michael by Ramiel, he is saved by Crowley, who realizes the magic is in the rune work and breaks the lance in two, causing Castiel's blackened wound to heal instantly in a flash of bright light. Before Dagon can deliver a killing blow to Castiel, the unborn Nephilim child of Kelly Kline transfers his power to Castiel. 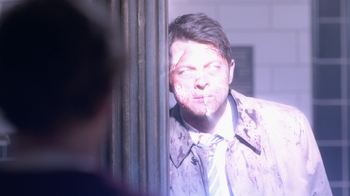 As it courses through him, all of Castiel's wounds are healed before he incinerates Dagon. Before leaving with Kelly, Castiel heals Dean's broken arm from his confrontation with Dagon. After seeing that Dean has injured his knee, Castiel heals him. Once Michael extracts most of Lucifer's grace, he heals his neck wound. When Lucifer learns of Sister Jo, he pays a visit and witnesses her healing an old woman, giving her the ability to walk without the need of a walker, and healing a veteran of his terrible facial burns. Seeing her work, Lucifer immediately recognizes Sister Jo as the angel Anael. The two come to an agreement, where Lucifer will siphon off her grace slowly, to allow her to regenerate it between extractions, in exchange for him not killing her. When Shaggy Rogers breaks his arm falling out a window, Castiel secretly heals the break before he and the Winchesters are sent back to the real world. Seeing that Gabriel is severely damaged due to Asmodeus's torture, Sam asks Castiel to heal him, but he is unable to as lower angels cannot heal archangels. When confronted by Asmodeus in the Bunker, Gabriel musters up all his energy, healing himself of all his wounds before killing Asmodeus. When Rowena angers Lucifer with the revelation Jack is in Apocalypse World, he is able to break his bindings and heal his neck wound to prevent any more grace from leaking out. After stealing Jack's grace, Lucifer places his hand on Jack's neck, healing the wound. After Michael collects blood from one of his captive vampires, he heals the cut on the vamp's neck before forcing him to drink his blood / grace concoction. Castiel attempts to heal a young woman, Lora, from the hex that has been placed on her which is causing her to rapidly age. However, due to the nature of the magic being too knotted, he is unable to heal her. In an attempt to heal Jack, Castiel places his hand over Jack and moves down his body, but is unable to heal or understand what is wrong with Jack, who begins coughing up blood during the process. After being resurrected, Jack recites Lily Sunder's Enochian spell, which taps into a piece of his soul, healing his body and preventing it from deteriorating without his grace. After reuniting with Sam and Jack, Castiel heals Jack's facial cuts from Garth's attack. After realizing Donatello's mind is trying to rebuild itself by trying to organize his memories of the Word of God, Castiel is able to find a fragment of Donatello's consciousness and bring it forward, waking him from his vegetative state. Castiel subsequently tells Dean that while Donatello remains soulless, he is back to normal and is no longer the twisted, corrupted version of himself that Donatello became due to the dark energy resonating within the demon tablet. In a diner bathroom, Jack begins having terrible coughing fits, which ultimately lead to him coughing up blood. After washing the blood from his hands, Jack uses his soul to heal himself. When Castiel is poisoned by the gorgon Noah Ophis, he is administered anti-venom which does not reverse the effects. With no other option, Jack taps into the power of his soul and heals Castiel. After accidentally stabbing Stacy with an angel blade, Jack attempts to fix the situation by removing the blade and healing Stacy's wound. After Sam suffers a serious head injury from Nick bashing him in the head with a rock, Jack heals him and saves Sam's life. This page was last edited on 6 April 2019, at 00:26.